The grace to repent during the final moments of life. The sabbatine privilege which consists of our being released from Purgatory on the Saturday following our death. 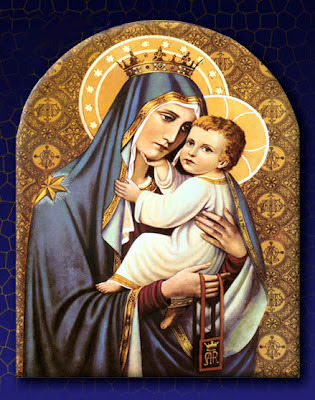 The scapular reminds us that we are under the watchful care of our Mother. She protects in life and at the moment of death. She helps us to overcome every temptation and difficulty. Wearing the scapular also signifies that we love her and are devoted to her. All the while we know that our devotion to her leads to her Son. She desires and aids us in doing his Divine Will because she loves Him and us. At the wedding Feast of Cana, she said to the wine steward; "Do whatever He tells you." She says the same to us all the time. This means keeping all of his teachings -- keeping the Divine Law. The scapular is a reminder that Our Blessed Mother is always so close to us. We should never worry or be distressed because she obtains the very power of God for us, for our protection and salvation.